In Excel. there are text functions that allow you to quickly change the case of the text (to lower case, upper case, or proper case). UPPER function is one of the many text function in Excel. It takes a string as the input and converts all the lower case characters in that text string to upper case. Use it when you have a text string and you want to convert it all characters into upper case. This can often be the case when you get the data from an external source and you want to clean it and make it consistent. One example of this could be when you have Product Ids in inconsistent format and you want to make it all in upper case. text: This is the text string in which you want to convert lower case characters to upper case. Here are some practical examples to show you how to use the UPPER function in an Excel worksheet. 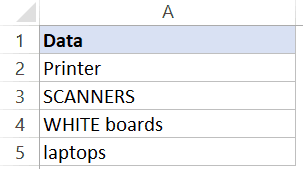 Suppose you have a dataset as shown below where you want to make it consistent and make all the cells text in uppercase. Suppose you have the address data as shown below and you want to combine this data. Since the state code is in lower case, you can use the combination of TextJoin and Upper formula to combine and get the address with state codes in upper case. Numbers, special characters, and punctuations are not changed by the Upper function. The UPPER function only affects the lowercase characters of the text string. Any character other than the lowercase text characters is left unchanged. 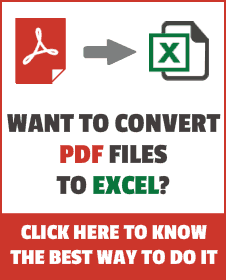 Excel Lower Function. – The Lower function converts a given text string from upper case to lower case. Numbers, punctuations, and special characters are not changed. 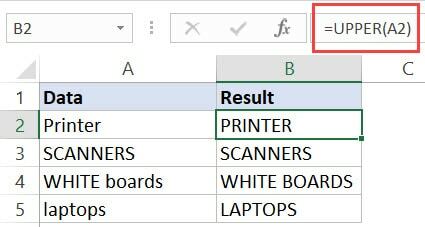 Excel TRIM Function – The TRIM function removes leading, trailing, and double spaces from a text string. Excel LEN Function: It counts the total number of characters in a cell. It’s commonly used to get the length of a text string. VBA UCase Function – It converts a text string to the upper case in VBA.